Should you eat at your desk? (MoneyWatch) COMMENTARY Over at Slate.com recently, Rachael Larimore launched quite a discussion with a post claiming that "I'd Rather Eat at My Desk." In response to folks writing wistfully about some European countries with their long lunches, Larimore pointed out that, for the working parent, a long lunch is just more time you're not with your kids. Maybe that's the point (they don't seem to be having many kids in Europe these days). But many of us like spending our evenings with our families. So, if you don't have a set time to punch in and punch out, but you have a high volume of work, is it better to power through and leave on time, or get away from your desk for a long break daily? I think the answer is, well, it depends. 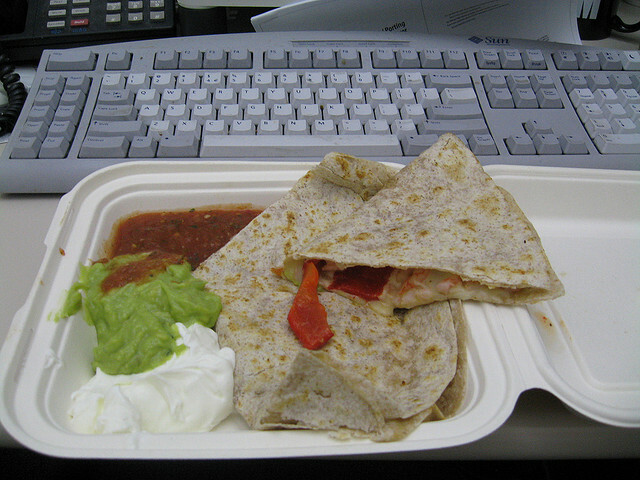 When I worked in a normal office years ago, I'd go to the office gym during "lunch" and then eat something at my desk around 2 p.m. I couldn't take two breaks, and so if I was going to take one, I valued fitness over hitting the company cafeteria. But I was a young, single gal then, and if I got home at 7 p.m. or later, it was no one's business but my own. If you want to leave at a reasonable hour, and have a certain quantity of work to get through before then, I agree that a lunch break is overrated. The office cafeteria fare is probably not gourmet. If you're eating by yourself in the cafeteria, or driving off campus to grab fast food, you're definitely better off eating at your desk (and maybe taking a quick walk outside to clear your brain later). The one caveat with all this is that lunch can be a great time for networking with other people at your office. If you eat with the same people every day, you've gone past the point of diminishing returns in networking with them. But a few times a week is still valuable. The best approach might be to go out to lunch somewhere special with colleagues once or twice a week, or start a brown bag club two days a week. Invite people from all different ranks to join so that people find it valuable. Then eat at your desk the other days, and go home early then.